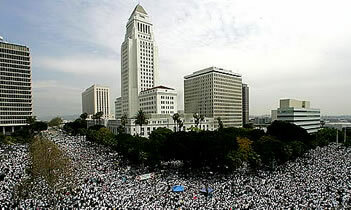 This the the official commemorative site for the L.A. Gran Marcha 2006, which occurred on Saturday, March 25th, 2006 in downtown Los Angeles. The information provided on this web site is maintained by Unity Corps, Inc. For further information about Unity Corps, visit the organization's main web sites located at www.unitycorps.org or www.unity.info. For further information about becoming involved with the Unity Movement visit www.unity.info or www.unitycorps.org. Unity Corps' mailing address is P.O. Box 29219, Los Angeles, CA 90029. Unity Corps' main telephone number is (323)850-8700. Note: This site is a special project between Xcano Media, a community based volunteer organization., and Cuerpo de Unidad, the Spanish language office of Unity Corps, Inc. It will continue to be maintained after the Congressional vote of Sensenbrenner King HR 4437 to commemorate the significance of L.A. Gran Marcha as a major historic American civil and human rights event. For information on how to contribute to this important project contact Xcano Media. All images submitted must provide credit sources.